California, home to the third largest coastline in the United States behind Florida and Alaska, joined all but three states in requiring some form of boater education when Gov. Jerry Brown signed the Boater Safety Law in September 2014. While California might have been late to the party, boaters across the state have long been subject to laws enacted by local, regional and federal legislators. Indeed, boating laws have been on the books for more than 100 years — though California did not have a formal state agency dedicated to recreational boating until 1957. 1910 – America’s initial settlers may have arrived here via boat since the 15th Century, but the first-ever federal law governing boats – Motorboat Act of 1910 – was not enacted until 1910. The law required boats up to 65 feet long to have lights, whistles, life preservers and fire-extinguishing capabilities. 1940 – Significant advances in motorized engines required the Motorboat Act of 1910 to be updated. Indeed, the first-ever federal boating laws were modernized in 1940. The Motorboat Act of 1940 established different classes of recreational boats, outlawed reckless or negligent operation of a vessel and set requirements for motorboat construction. 1958 – The Motor Boat Acts of 1910 and 1940 have company as the Federal Boating Act became law and required identification numbers for all vessels and reciprocity of laws between participating states. 1959 – It did not take long for California’s legislators to adopt elements of the Federal Boating Act. In 1959, state lawmakers required most undocumented vessels to be registered with the state, established a system of reporting boating accidents and enacted a comprehensive slate of laws governing equipment and vessel operation. 1961 – Recreational boating is not a natural resource, so it made sense when California officials relocated the Division of Small Craft Harbors from the Department of Natural Resources to the Department of Parks and Recreation. 1966 – Less than a decade after they were established, California’s Division of Small Craft Harbors became the Department of Harbors and Watercraft and Small Craft Harbors Commission was renamed Harbors and Watercraft Commission. 1968 – Selling yachts and ships became a state-regulated activity as legislators authorized the Department of Harbors and Watercraft to issue yacht and ship broker licenses. 1969 – The final year in a decade of upheaval, state officials adopt yet another name change. This time, Department of Harbors and Watercraft was renamed Department of Navigation and Ocean Development. 1969 – Department of Motor Vehicles became exclusively responsible for boat registration. 1971 – More than 60 years after the first boating laws hit the books, the Federal Boating Safety Act was enacted and established minimum safety standards for boats, a Boating Safety Advisory Council, penalties for negligent operators and registration standards for states to follow, among other requirements. 1971 – Without enforcement, a law is nothing more than words on paper. Accordingly, the Federal Boating Safety Act established the U.S. Coast Guard as the official regulatory authority to enforce safety regulations and administrative requirements. 1979 – The final year of 1970s meant the end of bell bottoms, disco and the Department of Navigation and Ocean Development. State officials renamed the agency with a more accurate moniker: California Department of Boating and Waterways, or Cal Boating. Evolving from decades of legislation are a myriad of laws governing boating equipment, rules of the road and boat operation. 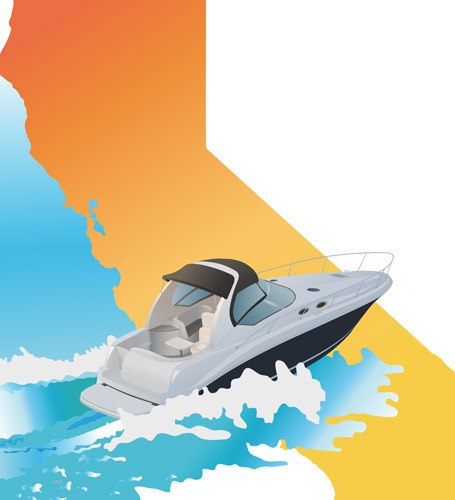 Many of these laws are detailed in “ABCs of California Boating,” including regulations on life jackets, personal watercraft, age restrictions, alcohol, carbon monoxide and head-on situations. In addition to Cal Boating, there are numerous county boards, harbor commissions and city entities governing recreational boaters and local waterways. For more information, visit the Cal Boating website at dbw.ca.gov. My team and I are participating in the National History Day Competition and we are making a website about how the tragedy of the Titanic turned into the triumph of new boat safety laws being made. We would like to interview you about these boat safety laws.